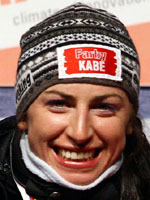 Justyna Kowalczyk became the first Polish person to claim a cross-country ski world title and also to win an overall world cup crystal globe in a 2008-2009 season which made of the 27-year-old a favourte for the Olympic title too. Having come third in the 30km at the 2006 Turin Games, the Limanowa native was far from unknown on the circuit she had been frequenting since the 2001 season, but she'd previously never really hit the heights. So her two gold and a bronze at Liberec (in the pursuit, 30km classic and the 10km classic) caused a minor sensation in the small world of cross country skiing. The only person at the pre-Olympic worlds to outdo her was the Finn Aino-Kaisa Saarinen who out in the Czech Republic took three golds and a bronze. But as all the favourites such as Slovenia's Petra Majdic, the Finn Virpi Kuitunen the 2007-2008 world number 1, and Saarinen fell victim to exhaustion during the final rounds of the world cup, Kowalczyk pipped every one of them for the world cup overall title. She had never before even been atop the standings and her crystal globe was also a first for Poland. The young Pole ended the season on tip-top form winning the 10km at the season ending Falun to claim that 2009 overall title. "I struggled all season to get this," said Kowalczyk, whose progression, from 8th in 2007 and third in 2008, has been smooth and regular. Her journey began back in 1993 aged ten with her first cross country race. Some eight years later, in December 2001, she saw her name jotted on the start list of what was to be the first in a long series of world cup races. She had to wait until January 2006 for her first world cup podium finish at a 10km classic at Otepaeae, in Estonia. A year ahead of Vancouver and she had pocketed six more of them, five in the pre-Olympic year. The gap in her medals cabinet, the lack of any Olympic honour, should, all being well, be filled out in Canada.